Now, with that out of the way, it is appropriate to highlight the Tolkien Birthday Toast on the evening of January 3rd (21:00 – or 9 PM – local time). For more information on the Birthday Toast, please refer to the Tolkien Society web-site. Well ... what it says, really :-) Members of the Mythopoeic Society may now, and until Febrary 14, nominate books for the 2016 Mythopoeic Awards. This month's most ludicrous headline …. Since it is a matter of New Line film imagery, Jackson has got mixed up in the affair, which seems to put it down to the film-character Sméagol. Since this character, judging by Jackson's comments, is fundamentally different from Tolkien's character of the same name (which is really the case for all – or nearly all – the characters that appear in both stories), I have little to add to this. The main problem here is that Colbert is once more wrong about Sméagol (see David Bratman's excellent commentary last month). Well … if it's for hot yoga, it is of course a different matter. The list has been compiled by polling 82 foreign book critics on the best novels by British authors. What makes it relevant here is that The Lord of the Rings comes in 26. Curiously only 4 of the books preceding LotR on the list have been published after LotR. 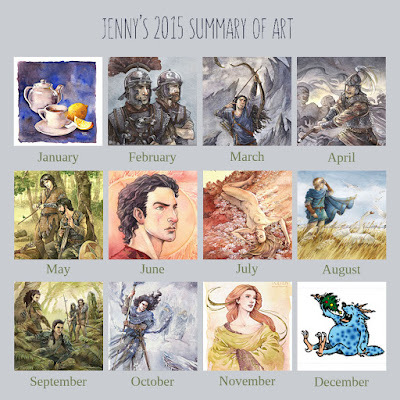 The only other Inklings-work to make the list is Lewis' Chronicles of Narnia as no. 97, which I, frankly, find somewhat surprising (that this would make the list at all). Tolkien-related courses taught by Douglas A. Anderson and Andrew Higgins. And remember that Tolkien Society members get a 15% discount when auditing classes! So join the Tolkien Society today! What it says, really. Courses include ‘The Inklings and Science Fiction’ taught by Douglas A. Anderson, ‘Language Invention Through Tolkien: Exploring a Shared “Secret Vice”’ taught by Andrew Higgins, ‘Modern Fantasy II’ taught by Corey Olsen, and ‘Elementary Latin I’ taught by Philip Walsh. The next series of the free-access Mythgard Academy discussions will focus on The Shaping of Middle-earth and Dracula. On the naming of a Tessaratomid bug from New Guinea, Tamolia ancalagon, after Ancalagon the Black, and the reasons for this naming. This year's theme will be ‘Life, Death, and Immortality’ in the life and works of J.R.R. Tolkien. I don't know how I managed to overlook Robin Reid's response when I discussed Schürer's article in last month's transactions, but here it is. I agree with Reid on most counts, but I also feel that, even with the impressive lists of MLA search results, she appears very defensive, attacking the weaknesses in Schürer's critique, rather than addressing the strong points. When listing what she agrees with in Schürer's critique, Reid mentions that the aim should be to “make well-developed, well-written, comprehensive, and compelling arguments”, but she does not mention his other criterion, to “[enhance] our understanding of his work,” which I would read as enhancing our understanding and/or appreciation of Tolkien and/or his work. Also, I do not refute that fan activities constitute a valuable area of academic study, but Tolkien scholarship it is, in my firm opinion, not! Reid asserts that she “simply [does] not agree that the academics who publish scholarship are not *generally* meeting these criteria”. However, if I add the criterion of the purpose of the criticism (not merely to make well-developed arguments showing how clever the critics are themselves), I have to disagree with Reid. A lot of Tolkien scholarship certainly does meet these criteria, but too much of it does, in my opinion, not. We see a lot of comparative criticism and source criticism, some of which also makes “well-developed, well-written, comprehensive, and compelling arguments”, but a lot of which seems unconcerned with telling us anything relevant about Tolkien or how to read or appreciate his works. Simon J. Cook is truly excellent when explaining the academic intellectual climate and the prevalent theories at the turn of the twentieth century; clear lucid and to the point. In his paper for Tolkien Studies, he particularly discusses the theories expressed by Hector Munro Chadwick in his 1907 The Origin of the English Nation. Cook's source analysis unfortunately suffers from the same flaw as most other source criticism that I have seen: it fails to discuss how any particular source interacted with other sources in Tolkien's fertile mind, but instead presents it as a simplistic one-source, A leads to B kind of causation. This to the point where the absence of an element of the source is presented as ‘an implicit rejection of a key element of Chadwick’s interpretation of Northern traditions’; an argument that can only be sustained in an over-simplistic model of how sources influence literature. I know that this may be merely unfortunate language inspired by the tradition in source-criticism, and that it may be just me who is over-sensitive to be bothered by it. However, Cook also proposes one way in which Tolkien's books can be interpreted as asterisk-myths and -legends leading to a mythological understanding of English and Nordic myths that, to a very large extent, resembles Chadwick's. This works excellently regardless of the extent to which one agrees with Cook's proposal that this was actually intended by Tolkien. I'll admit that including this article in my transactions is slightly tongue-in-cheek, but on the other hand, reviews are a large part of what this is about, and getting to know a bit about the history of reviews is a very interesting fun fact thing to do. For those of us who couldn't watch it in real-time, the Mythgard Academy discussions of Tolkien's Letters from Father Christmas is now available on YouTube. This time we get an insight into the kind of textual puzzles that face these two distinguished Tolkien scholars with respect to the textual history and intention of The Lord of the Rings. The specific question discussed here is the line break an indentation of the second half of the Tale of Years entry for Third Age 2951. Was that actually to have been an entry for TA 2952? Or …? Also Hammond and Scull discuss the Baynes / Tolkien Middle-earth map (see the last couple of months), where they refer to the French Tolkiendil site, which offers some discussion and commentary to go along with the high-resolution transcribed map posted last month at the Tolkien Society. Finally a reference to The Art of the Lord of the Rings by J.R.R. Tolkien leads on to good wishes. Spurred by recent additions (see under News above) to the list of factual mistakes about The Lord of the Rings that are fostered by Jackson's films, Bratman here lists three very common misconceptions – to which I dare say we could add more, even without listing ‘general falsities of spirit’ (too numerous to list, anyway) or those that people generally do realise are changes from the book. And let me just explain that I think that Jackson was perfectly in his right to make any of these changes! This is creative license, it is what any adapting artist must do – make it their own work. What bothers me is that people seem to conflate the two stories (Tolkien's and Jackson's) despite the wide gulf that exists between them. It is the misconception that they are the same story that gives rise to the mistakes, Bratman lists here. Let me hurry to say that Sandbrook answers the titular question with a firm rejection: “all the evidence shows that if one book, more than any other, captured the Western imagination after the mid-1950s, that book was The Lord of the Rings.” The piece is an interesting perspective; though it doesn't provide anything new on Tolkien himself, that is, for piece of this length, easily made up for by the comparisons to other authors and the wider societal trends. This is a part of a multi-part series on J.R.R. Tolkien and C.S. Lewis. The approach is largely religious, though it generally doesn't give the impression that the religious angle is the only relevant perspective on the authors. Hawbaker has some interesting comments on how the two authors deal with the concept of the larger story. Unfortunately he doesn't include Tolkien's use, in published letters, of the word Author to refer to God. While the juxtaposing of Tolkien and Lewis is interesting, the discussion of Tolkien's view on the nature of evil is not particularly deep and contains some factual errors (e.g. about Smégol), and I would recommend reading a combination of Shippey (The Road to Middle-earth and Author of the Century) and Jonathan McIntosh (the 54-part blog series on Tolkien's metaphysics of evil) if you wish to understand this aspect better. In addition to part 2, part 1 and part 3 have also been published in December. A small divergence to last month's informal café moot (I wonder if Ian would agree to share those pictures in an upcoming post ...), and a step back to ‘The White Rider’ before moving on to ‘The King of the Golden Hall’ explains why the reading group didn't reach ‘Helm's Deep’. As always, the summary of the discussions is interesting. West here discusses his own enjoyment of Tolkien, and of The Lord of the Rings in particular, in the light of being, in his own words, a ‘queer feminist’. I particularly like his discussion of Éowyn as “Tolkien’s most masterful female creation”, but also his distinction between Tolkien's intention and his own response (to the relationship between Sam and Frodo – and I surely am 100% certain that Tolkien intended nothing sexual, whatsover, with that relationship). News of the October 2016 publication of a deluxe HarperCollins edition of Tolkien's The Story of Kullervo. Recommendations for a Tolkienian Christmas. Besides the ‘big three’, The Hobbit, The Lord of the Rings, and The Silmarillion, the post lists Unfinished Tales, The Children of Húrin, The Legend of Sigurd and Gudrún, The Fall of Arthur, and Beowulf – a Translation and Commentaryalong with notes (much of which seems quoting from the books' descriptions – possibly from HarperCollins). A good choice of books, and great to see some of the non-Middle-earth books get some attention on lists like this. Expanding on their entry (seven pages) on biographies in the Reader’s Guide volume of their J.R.R. Tolkien Companion and Guide, Christina Scull gives a very brief survey of a number of biographical books, including a few works that offer new research on Tolkien's life (adding titles to the ever-growing list ...), before moving on to a more detailed review of two biographies, J.R.R. Tolkien: The Making of a Legend by Colin Duriez and Tolkien by Raymond Edwards. This review certainly puts the latter on my wish-list. Continuing from Christina Scull's post (q.v. ), Hammond discusses two recent Tolkien-related biographies: The Fellowship: The Literary Lives of the Inklings by Philip and Carol Zaleski, and J.R.R. Tolkien: Codemaker, Spy-master, Hero by ‘Elansea’. For the full review (including any positive sides), read Hammond's post – here let it suffice to say that Hammond's reviews convinced me that my decision not to pursue either book was entirely correct. West's review of the Zaleski book is considerably more positive than Wayne Hammond's, but it doesn't suffice for me to go near the book. in which Fisher comments on the new issue. I know well that I am terribly predictable in some ways, but I will not forego a chance to list and praise a review of Verlyn Flieger's Splintered Light: Logos and Language in Tolkien's World that calls it “a stellar example of sound literary scholarship” :-) I couldn't agree more with that assessment. A review of a non-Tolkienian book, Fifteen Dogs by André Alexis, that nonetheless manages to place itself in a dialogue with Tolkien's treatment of life, death and immortality – which is incidentally the theme for the upcoming Tolkien Reading Day in March. Another of Gilronan's utterly charming Shire pictures! Húrin chained to the chair on the slops of Thangorodrim. 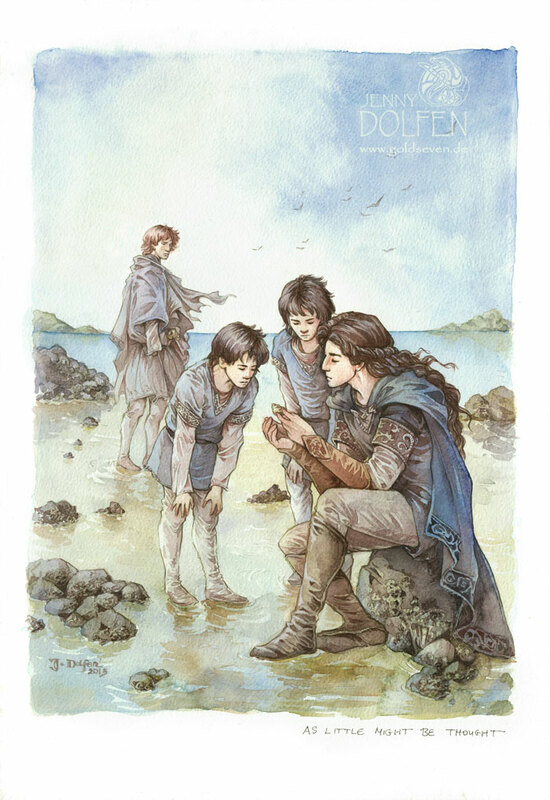 Here Jenny Dolfen is back in the First Age at the strange love that grew between Maglor and the twins of Eärendil and Elwing, Elros and Elrond. Illustration of a passage from ‘Aldarion and Erendis’ in Unfinished Tales. Tomás Hijo has created a video showing him colouring in his ‘Riddles in the Dark’ picture. Enjoy these stunning pictures of the beautiful, hand-calligraphed Parma Eldaliéva! Hithlum – Hisilómë – the Land of Mist …. Middle-earth News have been running an advent calendar, starting out in the classic Christmas filking tradition with Smaug the dragon’s coming to town. With some further pertinent comments relating to his post at the Tolkien Society website last month about Stephen Colbert. I think it is fair to accuse the headline of overselling the message here. The article is about a recording C.S. Lewis made in, probably, 1941 on ‘The Norse Spirit in English Literature’. This was meant to be broadcast in Iceland during the war, and the claim here is that it was at the instigation of the military intelligence. The author of this piece has purchased a record with the first and third parts, missing the other record with the second and fourth parts of Lewis' message. Dana shows, and is interviewed about, her tattoo of the Ring verse. On December 23rd, we came to the Letters from Father Christmas, including a picture of one part of the 1925 letter. The main thrust of this piece is about Star Wars, and particularly about the newest instalment, The Force Awakens. The comparison to Tolkien's legendarium, however, is interesting, even if it only works to a certain level. The analysis extends one or two levels deeper than just reading LotR (to where you come to understand Galadriel's words about fighting the long defeat), but at a yet deeper level, you discover the hints of a final hope. A highly interesting thread resulting from a statement by China Miéville on the literary powers of recognition and estrangement. A mostly story-internal (or ‘Ardalogical’) thread about the One Ring and its powers – and its lack of other powers (or abilities or qualities). Another story-internal thread about the self-arrayal of the Ainur in bodies, and how this varies. I love Jansson's illustrations! The illustrations for the current Tolkien calendar were made for a Swedish edition of The Hobbit by Tove Jansson of ‘Muumin’ fame. 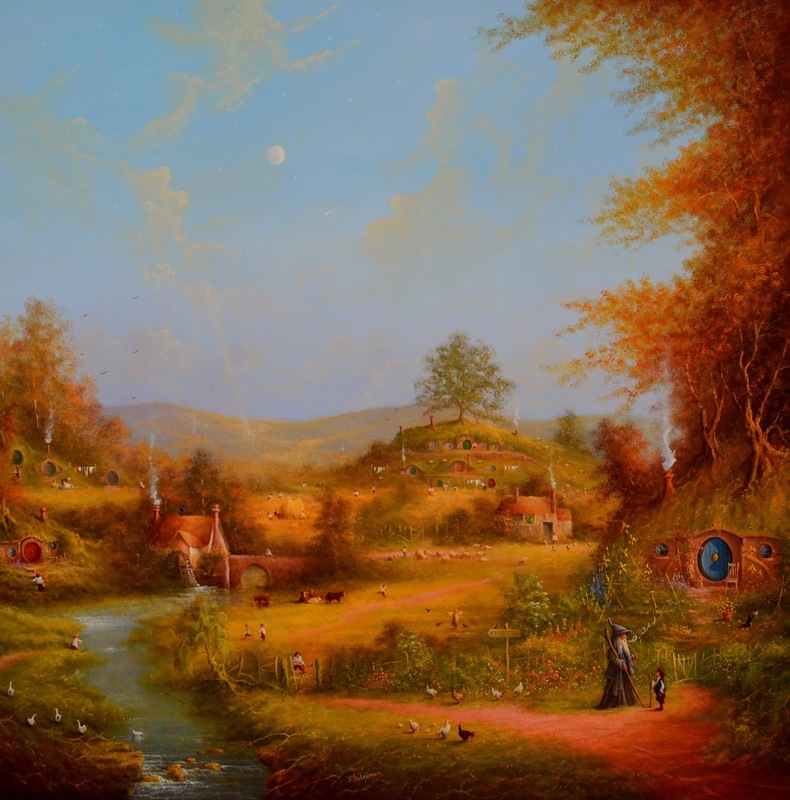 Her Hobbit illustrations are at one time have some clear parallels to some aspects of the Muumin universe, but at the same time they are fundamentally different. I am particularly fond of her black and white drawings, which I find far more effective than the two colour illustrations that are included (Jansson is not the only Tolkien illustrator for whom I have found that I prefer their B/W drawings and sketches). Having enjoyed Fairburn's illustrations over the past year, I now look forward to enjoying this year's Christmas gift from my dear daughter. Amon Hen 256, The Tolkien Society. Lots of material about the goings-on of the Tolkien Society in this issue. Please consider supporting our Tolkien to the World project at the Tolkien Society web-site – the current project is to send copies of the proceeding from the 2005 The Ring Goes Ever On conference to relevant libraries. Also featured as some delightful reports from Oxonmoot (in September), and a review of ‘Elansea's’ J.R.R. Tolkien: Codemaker, Spy-master, Hero by Ted Nasmith, who admits being biased by his friendship with the authors (Lewis and Currie) before giving the book the most (the only, actually) positive review, I have seen yet. Mallorn 56, The Tolkien Society. With the newest issue of Mallorn appearing in my mailbox (the physical one) only on the day of New Year's Eve, I haven't had time for more than skimming the issue very cursorily. This issues seems to include rather more essays than usual, but of the usual rather wide range of quality. But Mallorn is not a peer-reviewed journal of scholarship, but rather the high-end journal of the Tolkien Society. This means that Mallorn could and should offer untried hands an outlet for their first essays in the craft of literary criticism essay-writing. 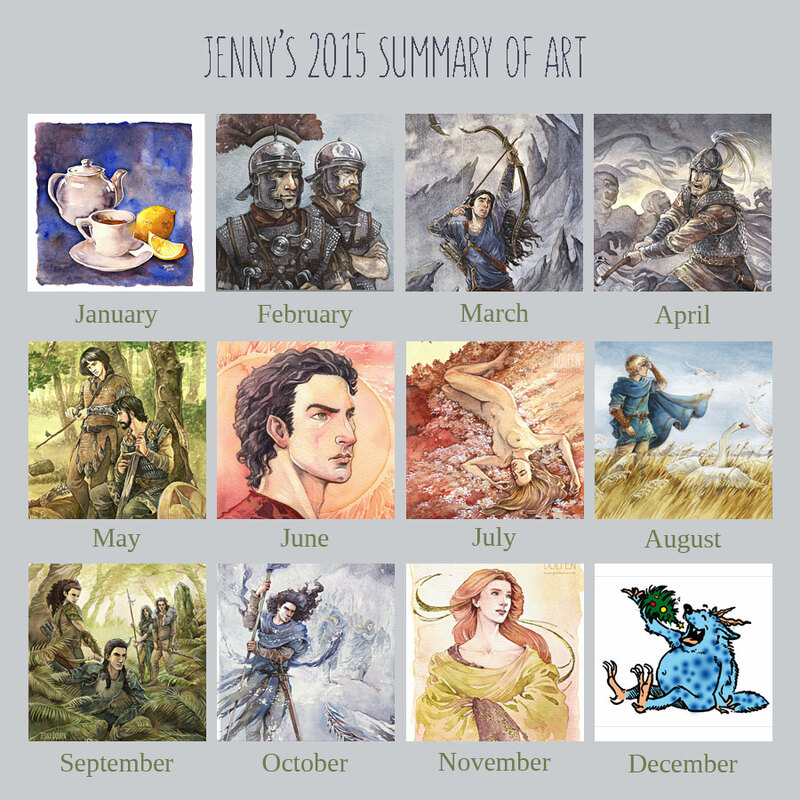 Beyond Bree, December 2015, Tolkien Special Interest Group. Dale Nelson's article on ‘Days of the Craze’ (at no. 18 in this issue) is as always a good read, and manages to make the rest of the issue seem mere filler. Peter Xavier Price has been featured as the artist behind the Tolkien Society Christmas card this year, which has generated interest in Price's excellent Tolkien illustrations. Archive of posts from December 2015 – McIntosh is currently posting a series on Anselm's Cur Deus Homo. In my critique of Simon Cook's essays, I criticise the narrowness of the focus because it leads to a presentation that does not, in my view, acknowledge the existence of anything outside the focus. I am, however, aware that this is not just a problem with Simon's work, but is common in source-criticism, and I may to some extent have let my general frustrations affect my critique here. In most, or even nearly all, of the Tolkien source-criticism I have seen, the causation of source upon the final work is presented in a very simplistic manner, that, in my opinion, is not able to tell us anything about Tolkien. However, I think it would be far more interesting if such studies were to attempt to look at how the source under investigation interacted with the other things that Tolkien read, wrote, saw, heard, and lived through. Such an approach would, in my opinion, make source-criticism far more worth-while than the normal approach we see now, enabling us to enrich our understanding of Tolkien as scholar and author.